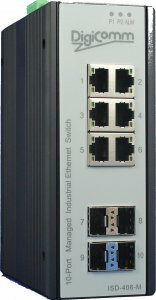 The DigiComm ISD-406-M industrial Switches provides 6x Gigabit-Ethernet and 4 x Gigabit-Fiber-Ports. The fiber optic ports can be equipped with any SFP modules for individual adaption to your own network and thus guarantee a wide range of applications. Supporting 10/100/1000 Base-T (X) and 100/1000 Base-F (X) Gigabit ports, the DigiComm ISD-406 is ideal for use in complex high-speed networks. The entire DigiComm ISD-406 switch series has a redundant DC power supply of 12-60VDC, an IP30 protected all-metal housing and is suitable for mounting on a DIN rail. Depending on the requirement profile, the DigiComm ISD-406 series is available in manageable Layer 2 (ISD-406-M) or unmanaged (ISD-406) version. All important and safety-relevant protocol standards are supported with VLAN, SNMP v1 / v2 and v3, HTTPS, IGMP v1 / v2 and v3.